Suspicious by nature, I find myself imagining the conversation that led to mounting The Judas Kiss as something like: “Let’s have a literary hero, an emotional rollercoaster of a script, a movie actor to star in it, and a couple of beautiful boys swanning about naked at intervals!” And indeed, the show had a very successful run in London before stopping by The Ed Mirvish Theatre on the way to Broadway. The truth about the formula, though, is that it works: The Judas Kiss is remarkably satisfying on several levels. Dramatizing the last moments before Oscar Wilde’s arrest for gross indecency in the first act, and a day three months after his release from Reading Gaol in the second act, The Judas Kiss contains every possible shade of the emotion of love. If you’re a romantic, as I am, it’s quite irresistible to see, and very well performed overall. Admittedly, I was skeptical of Rupert Everett, an actor I am most familiar with for being in a terrible movie with Madonna. I wasn’t sure how he’d do playing Oscar Wilde as anything more nuanced than a buffoon or a fop. Pleasingly, Everett really found a lot of emotional range for the role, and we absolutely believe in him as he makes terrible decisions for the loveliest reasons. It’s a fantastic performance, full of vigor despite the fact that Wilde spends the bulk of his time onstage sitting down, dead centre, in a deep chair. Opposite him, making practical decisions for base reasons, is Charlie Rowe as Lord Alfred Douglas, Wilde’s lover during the time of his disgrace. Rowe plays Douglas as piquantly awful and strewn with half-truths, with a selfishness that’s breathtaking to watch. There came a moment in the second act, as the play reached its conclusion, where had we been at the panto I would have booed at the top of my lungs. Rowe finds his way into the character of the lazily wealthy youth playing at being a bohemian remarkably well. The cast is rounded out nicely with Cal MacAninch as Robbie Ross, Wilde’s longtime love, who remains unable to hide how baffled he is at Wilde’s decisions. 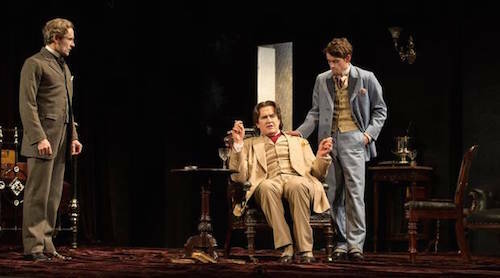 One of the most affecting moments of the play is delivered by Alister Cameron as Mr. Moffatt, the butler at the Cadogan Hotel, whose affection and sense of protectiveness toward Wilde as a fellow gay man are luminous as he walks a very careful line between serving and seeing. I can imagine this being dismissed as “a gay play” or even as “an old-fashioned play” by someone whose theatrical tastes run to neither – if they haven’t seen it yet. But really, The Judas Kiss is a profoundly universal play about love and power. It touches on all the ways love makes us act, from nobly steadfast to craven, and all the stages of loving and being loved from blind and stupid infatuation to the deeply patient love of long knowing. If that’s a journey you’ve ever taken without holding anything in reserve, you’ll adore this. The Judas Kiss is playing at the Ed Mirvish Theatre (244 Victoria Street) until May 1st. Performances are Tuesday-Saturday at 8PM with matinees on Wednesday, Saturday & Sunday at 2PM, with a few disruptions to the schedule in early April.